Professor Tsumoru Shintake from the Okinawa Institute of Science and Technology Graduate University (OIST) has developed a futuristic electron microscope going through a similar routine. Scientists from OIST have described the development of this unique microscope to be a pivotal step in the Microscopy journal. In this microscope, atom-thin layers of graphene were used to improve the microscopic images of minute viruses. In electron microscopes, the target sample is illuminated by using an electron beam in the place of light. When the electron beam hits the sample, the consequent scattering of electrons enables Researchers to construct a precise image of the sample ‒ the main reason why electron microscopes have the ability to accomplish a comparatively higher resolution than light-based devices. The innovative microscope developed by Professor Shintake is not even dependent on optical lenses; rather, it uses a detector to display the electrons that hit the tiny virus samples and reconstructs the image by means of a computer algorithm. 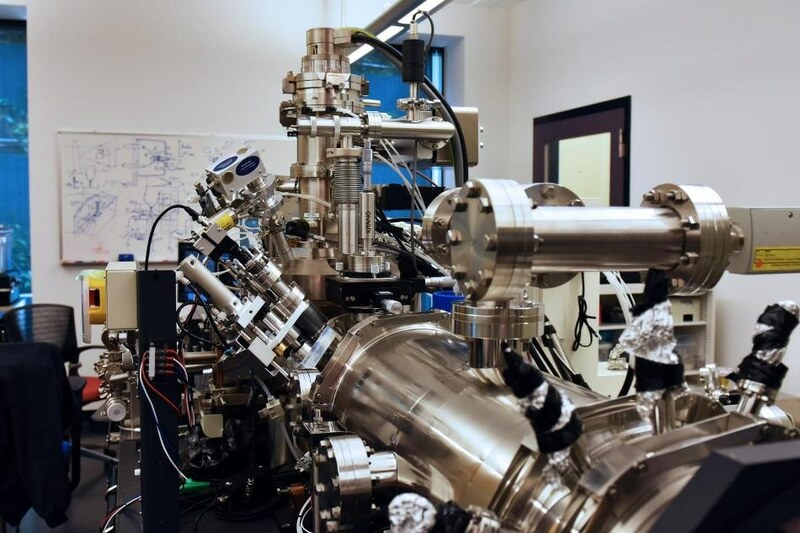 Furthermore, in contrast to traditional electron microscopes that need high-energy electrons, the focus of the new microscope is on low-energy electrons that can be prospectively more effective in imaging viruses if the related technical challenges can be solved. Low-energy electrons interacts very strongly with matter. They are great for imaging biological specimens, made up of light materials like carbon, oxygen and nitrogen, which are basically transparent to high energy electrons. However, while using low energy electrons, high sensitivity of the low energy electron beam with matter will make it to interact not only with the target sample but also with other things such as the film and the support plate on which the sample is mounted, which is a significant disadvantage. Consequently, the study material cannot be differentiated from the background by looking at the resulting image. In order to offset the effect, Scientists at the Quantum Wave Microscopy Unit relied on the distinctive characteristics of graphene. They developed a film formed of a single atom layer of graphene for displaying biological samples such as viruses under test. As graphene is exceptionally conductive, electrons can easily cross the layer, thus restricting the interaction of low energy electrons with the background graphene layer and increasing the interaction of the electrons with the virus sample, thus differentiating it with a higher contrast. The high conductivity also eliminates “charging-up,” wherein the electrons accumulate on the film leading to distortion of the final image. As the film is very thin, it provides a considerably bright background and consequently a better contrast with the target sample, when compared to traditional carbon films. The graphene film allows us to achieve great contrast with very low energy electrons, allowing to enhance tiny details. Yet, a graphene film cannot be handled easily. The film is very clear that it must be pristine and free of contaminants. Hence the OIST Researchers developed a method to carefully clean the graphene film. Another problem in loading the target sample onto the graphene film is that the film is oily, but biological preparations are generally water-based. Hence the preparations will not mix well and when the viruses are loaded onto the film, the viruses stick together in the form of scattered dense spots, thereby rendering it impossible to exhibit the distinctive features. In order to overcome this challenge, the OIST research team employed centrifugal force to scatter the viruses over the total surface of the film, thus avoiding clump formation. The viruses are added to a tube. The graphene film is positioned at one end of the tube. The other end of the tube is fixed to a vertical axis which is rotated to nearly 100,000 rotations per minute. Due to the centrifugal force, the viruses are pushed onto the graphene film, thus preventing them from forming clumps and enabling them to obtain individual details of each specimen from the electron microscope. As a consequence, the Researchers were able to obtain higher resolution images of the shells of the viruses. The shape and morphological characteristics of the shells can hint at the way to battle with them. The OIST research team demonstrated their successful research by using the bacteriophage T4, a familiar virus that affects particular bacteria. By using graphene and a low-voltage electron beam, the Researchers revealed its minute features such as the fiber-like limbs used by the virus to hook onto its bacterial prey. This detail was earlier not evident when a traditional carbon film was used. Dr. Yamashita and his colleagues have been hitherto working to enhance the image quality even more. In order to reconstruct images and to analyze the morphology of different kinds of specimen henceforth, higher consistency between samples is important to compare microscopic images of biological samples at the miniscule scale. For accomplishing this condition, the research team is currently working to develop a robust technique to prepare the virus sample by spraying the viruses onto the graphene film under sterile conditions. Miniscule viruses cannot go invisible for a longer period of time.